I'm assuming most of our readers can guess what this very gothic carved bat and its salamander prey is, but can you tell me where it is? Ten points to anyone who can correctly name the town and the building it is in. Answer: I thought this one might flummox everyone. 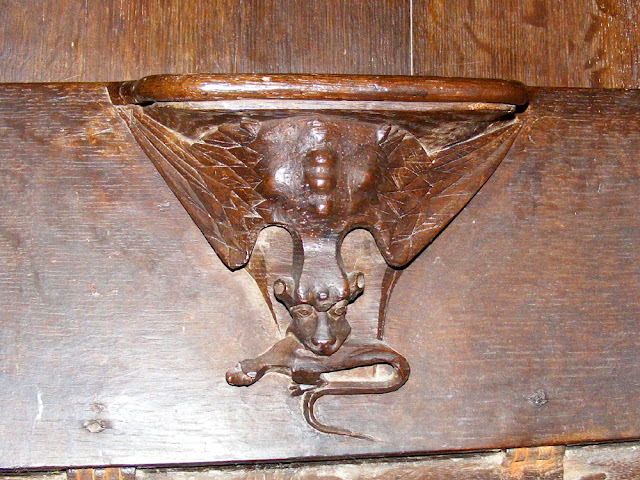 Chm is quite right, it is a misericord. It is in the church in Mezières-en-Brenne. It is not easy to spot and I only found it because I checked each and every misericord carefully. If you visit the church, be prepared and take a torch. I was alerted to its presence because I noticed a very small illustration of it on the church notice board, so I then went hunting for it. I imagine lots of people visit this church and never notice it. Our posts on Sundays have an Australian theme. To read more of them, click here. 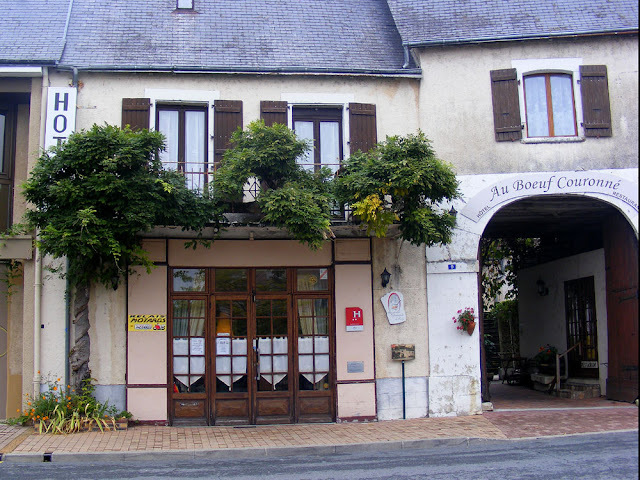 We have driven the road from (kind of) Boussay to (kind of) Rouvray - the D515 - a number of times. 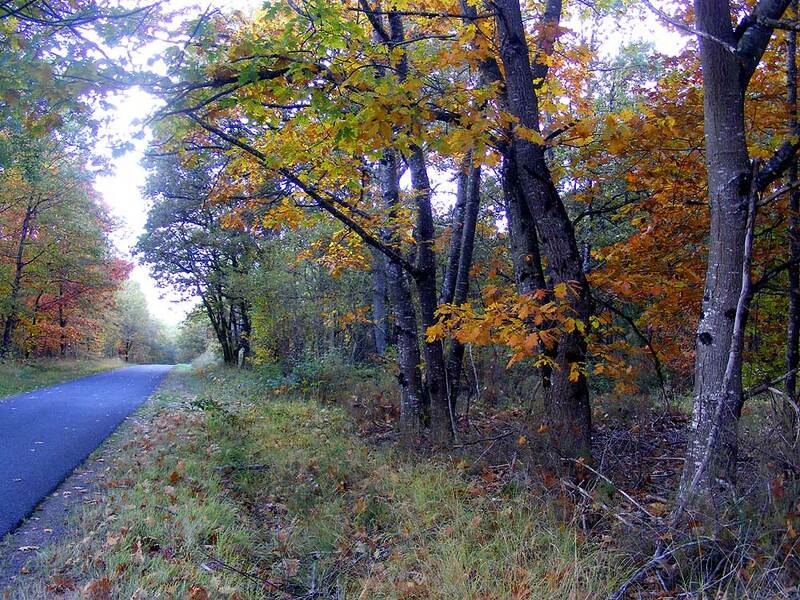 It's pretty, and in Autumn the colours can be really vibrant, but really it's just an average road through an average forest which has been fenced off to keep the deer and boar in. The location isn't signposted, so the only way you would discover the name of this particular piece of forest is from the IGN map: this road holds what is possibly a dark secret - or a ghost. I assume that rather than it meaning what one fears, someone found an incomplete statue of the Goddess Diana - not an impossible theory, because there are plenty of tales of Roman discoveries. Architect Jean-Philippe Barthel talks about the project. As long term readers may remember we are involved in the efforts to save the Chapelle de Tous les Saints in Preuilly. 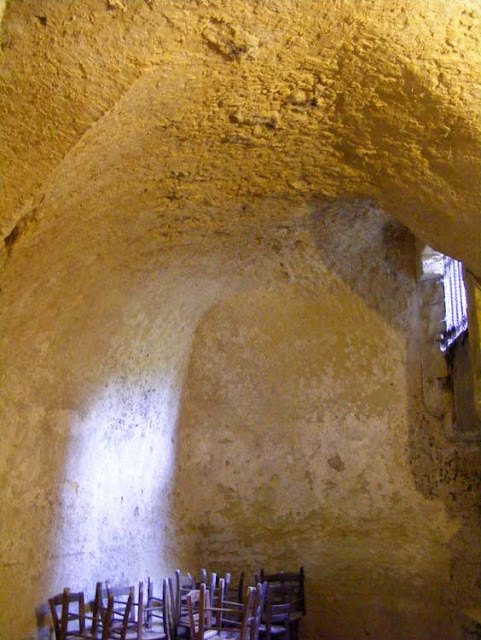 It is in a parlous state, with a broken main roof beam and leaning stone walls. Inside is a precious remnant of the late Middle Ages or eary Renaissance. The chapel contains a very rare wall painting depicting a danse macabre. It is one of only nine danses macabres surviving in France, and most importantly, one of only two which depict women as well as men. President of the local history association (SAP) Bernard de la Motte says a few words. Since we first met with the Fondation du Patrimoine, the wall paintings conservator and tendered for architects, Bernard de la Motte has been beavering away to secure grants to fund the project. In May he finally received notification that DRAC (the Department of Culture and Communication) would give the maximum allowable grant of 40% of the total funds. 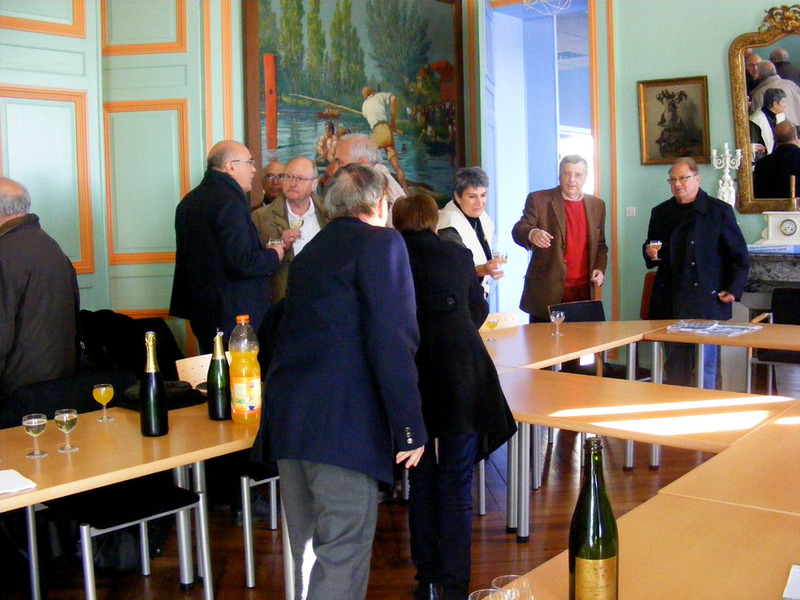 Charitable grant giving organisations such as La Sauvegarde de l'Art Français are also lined up. SAP members Jill Elton-Wall, Gilberte Blaszczyk and Christine de la Motte have raised around a thousand euros with their efforts sewing and selling small textile pieces (spectacles cases, Christmas decorations, bags, cushions, etc). Dominique Robin has made a video about the chapel and Bernard has written a booklet about the history of the chapel and its importance; Antoinette and Niall translated it into English so the booklet is in both languages. 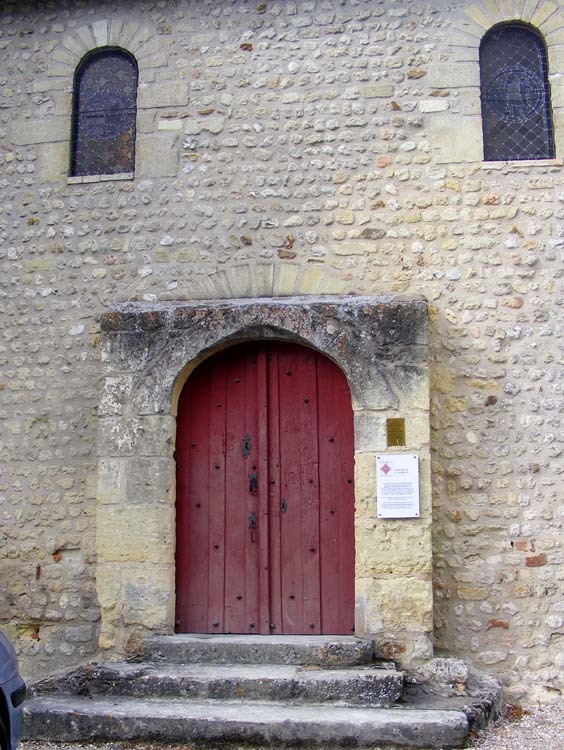 Antoinette and Niall also went off to Troyes in May for the annual conference of the Association des Danses Macabres d'Europe where Antoinette delivered a brief talk about the chapel and brought it to the attention of many interested scholars. While there she was able to network a bit and get more of an idea of where our danse macabre sits in the genre. She also raised €60 with the sale of booklets. 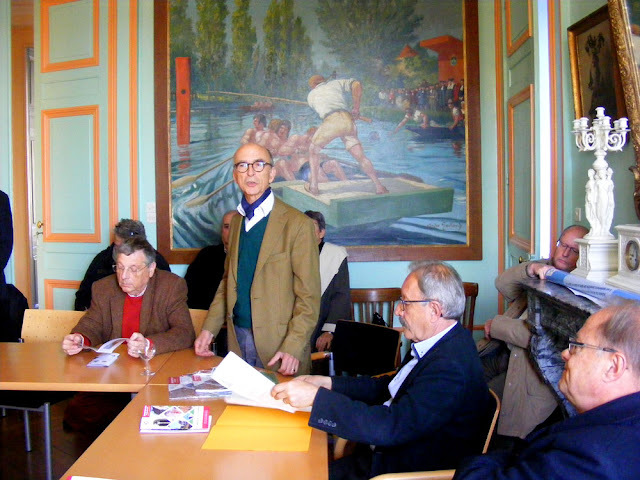 Mayor Gilles Bertucelli and Fondation du Patrimoine representative Jacques Guionnot sign the fundraising agreement. 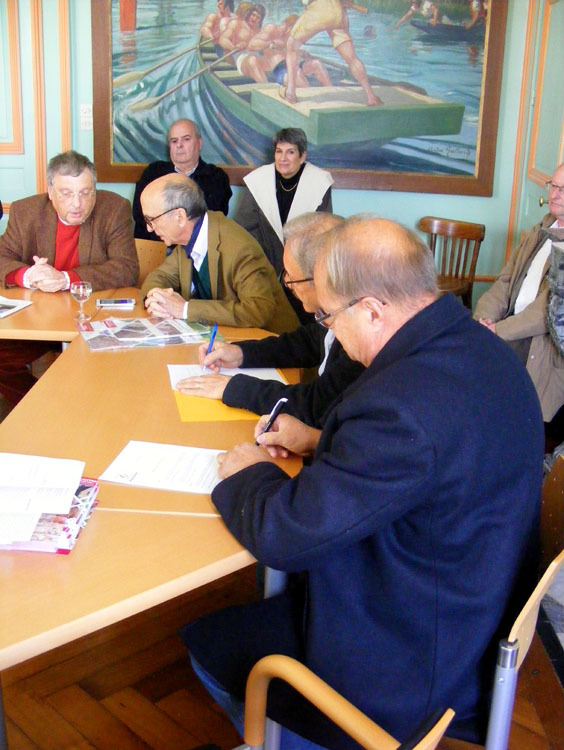 The final piece of the funding puzzle is to seal the agreement between the Fondation du Patrimoine and the local town council (commune). The Fondation du Patrimoine will promote the project and administer the fund raising. They will then hand the money over to the commune to fullfil the locals part of the bargain, but in order to remain eligible for the DRAC grant we must raise 5% of the total funds. That's about €15 000 we need to raise as our contribution to the €300 000 needed to complete the project. Drinks and mingling at the end. It is hoped that work will start sometime next year. Jean-Philippe Barthel is planning to hold occasional site visits for donors to see the progress. He feels it is essential to keep donors in the loop like this. I've briefly discussed doing the visits jointly with him so I can translate for anglophones. When I spoke to him about this he grinned ruefully and said, in heavily accented English, that his English is very bad. He then proceded to tell me a story, in French, about taking a group of American students on a visit to see the stained glass windows of Blois cathedral. It was an experience he doesn't want to have to repeat. 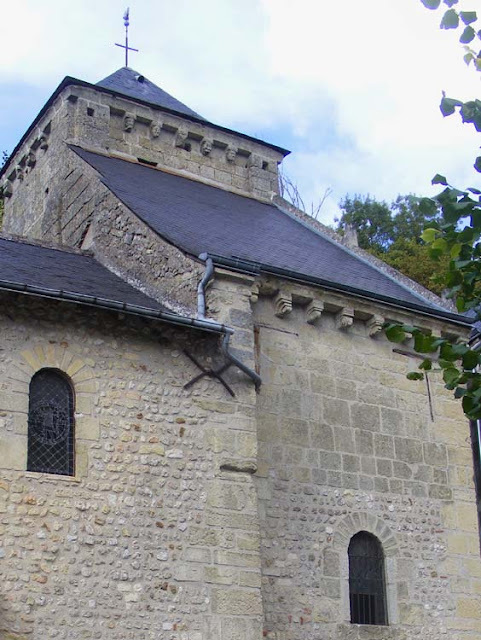 If you would like to contribute to the project you can make a donation via the Fondation du Patrimoine page for the Chapelle de Tous les Saints, Preuilly. Remember that if you submit a French tax return you can offset the donation against income, and the chapel fund benefits from an extra 66¢ from the State for every €1 donated. Our previous posts about the chapel and its danse macabre are here. Can anyone remember how Halloween/All Saints Eve was celebrated in France pre-Disneyfication (if at all)? We have asked around, but all we get back is "it's all American these days". Computer News: We picked up the office computer from Georges at the Geek Garage yesterday. He was unable to put the new computer's innards into the old case because the motherboards were not compatible. However, he has done some 'panel beating', as he termed it, and straightened up the case and the power pack, as well as sort out the on/off button, which was stuck. Simon got it all up and running, except for our photo archive database. He very much fears he is going to have to re-index every photo. This impressive wisteria is growing outside Au Boeuf Couronné restaurant in Mezières-en-Brenne. Even in mid-October it still has some flowers! This t-shirt is special in a number of ways, but mainly because I think it is the first gift Susan ever bought me. Back in the day, before internet, emails, text messaging and cheap international phone calls, buying something from overseas was a real palaver. It involved seeing adverts in specialist magazines of choice (in this case probably the UK magazine "Guitarist", which I used to collect at a Toowoomba newsagency 3 months afer publication date) and sending off a letter with an international money order (ask your parent's, kiddies), and then waiting the thick end of another 3 months to receive the goods. I wore the t-shirt on stage for many years, as can be proved by the below photo. 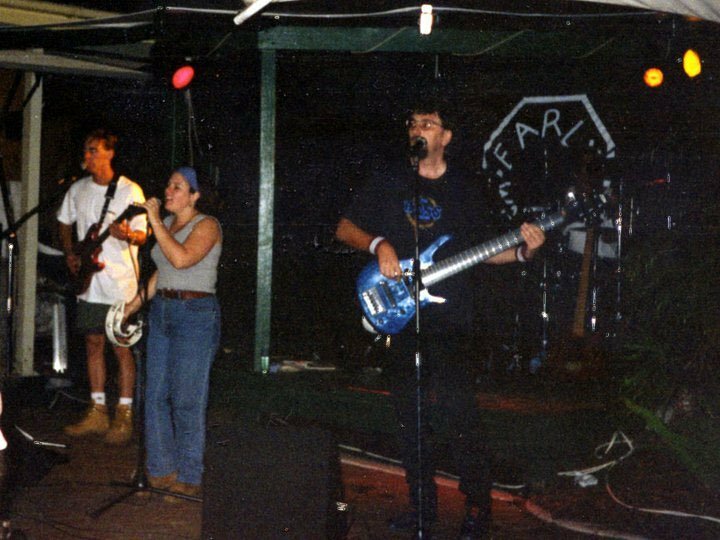 Also in the photo are Matt, Poss (Melinda) and Dr Rock's drumkit (Greg). If I was pushed to guess I would say it dates from 1995. Computer News: Simon had the bright idea that we could use the case from our old computer and the innards of the new, so we have taken them both to the Geek Garage in Mezières-en-Brenne. Georges, the resident geek, says he can put it all together in an hour or so and we can go back and pick it up on Thursday morning. When we got back from delivering the desktop towers to Georges yesterday we discovered that my laptop had finally decided to update Windows! Woohoo!! A double win (hopefully). 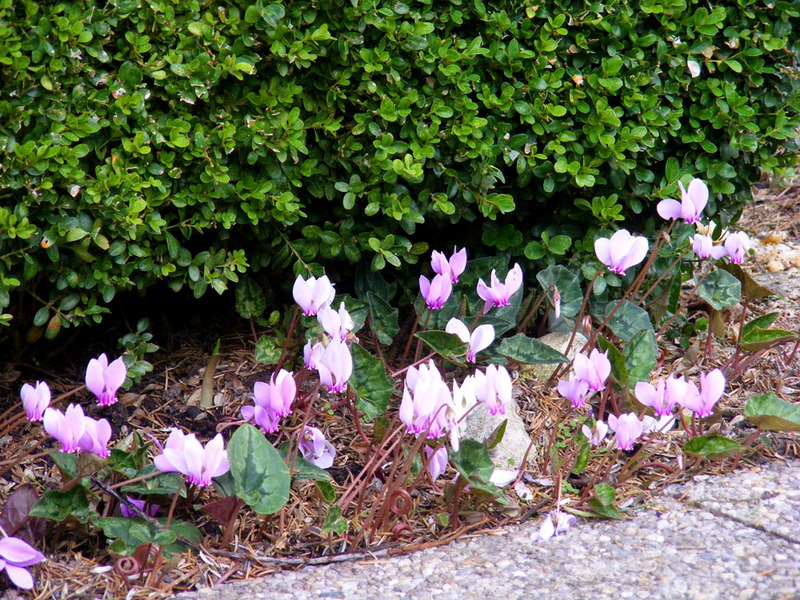 This year's cyclamen photos come from the grounds of the chateau in Preuilly, and from the garden of friends who live at the base of the chateau walls. 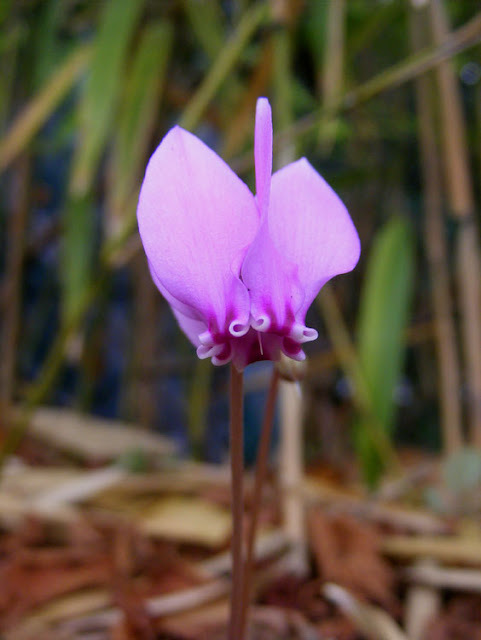 For our previous year's cyclamen posts click here. Computer News: The suppliers of the computer we ordered which arrived damaged have refunded our money. Meanwhile, my laptop has now been running continuously for more than 48 hours and is still 'checking for updates'. 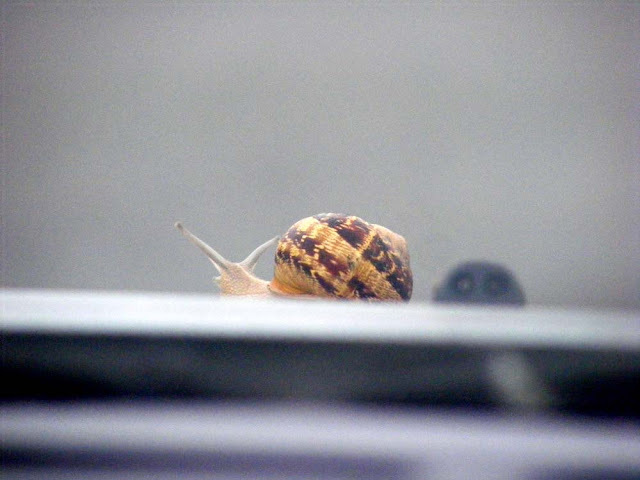 Sammy the Snail wins the lottery. He goes out and buys a Lamborghini. But because he is so ridiculously rich now he wants the car to be even more eyecatching, and he has the letter 'S' painted as large as possible on the sides. Simon tells me that this is one of his favourite jokes!? It was he who came up with the title for this blog post. 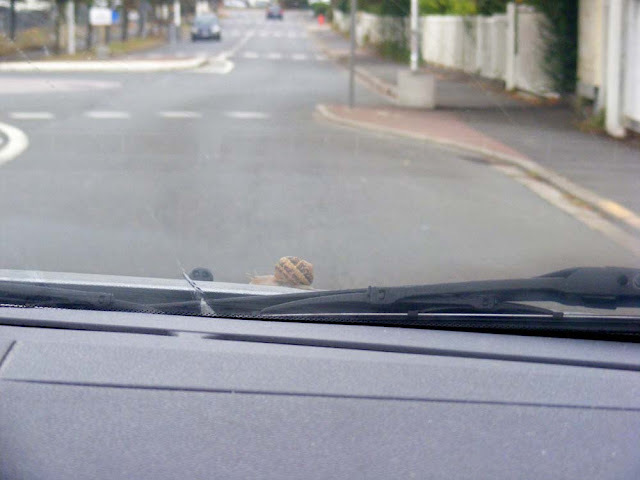 The snail on our bonnet was there one morning in September and we drove off without noticing it until on the road. I like to think he was enjoying having his little antennae eye stalks flapping in the wind, like a dog sticking its head out the car window. It's just a pity we drive a Ford and not a Nissan. 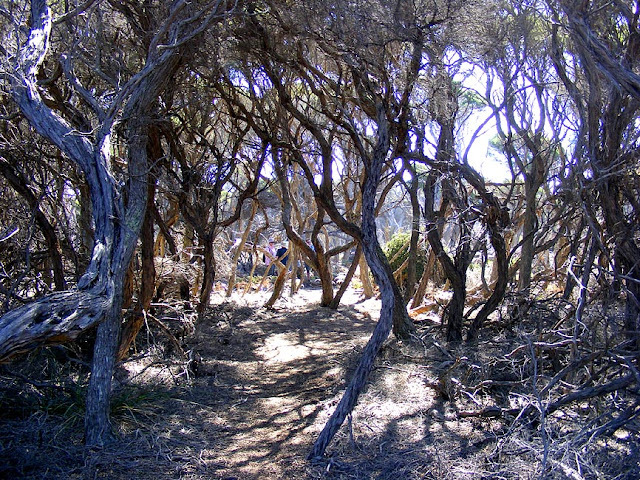 Swamp Paperbark Melaleuca ericafolia, their contorted trunks and dark canopies making them look like a forest from a fairytale. I can see my mother and sister (or is it my aunt?) in the middle, but can I reach them? On Sundays our posts have an Australian theme. If you would like to read more of them click here. 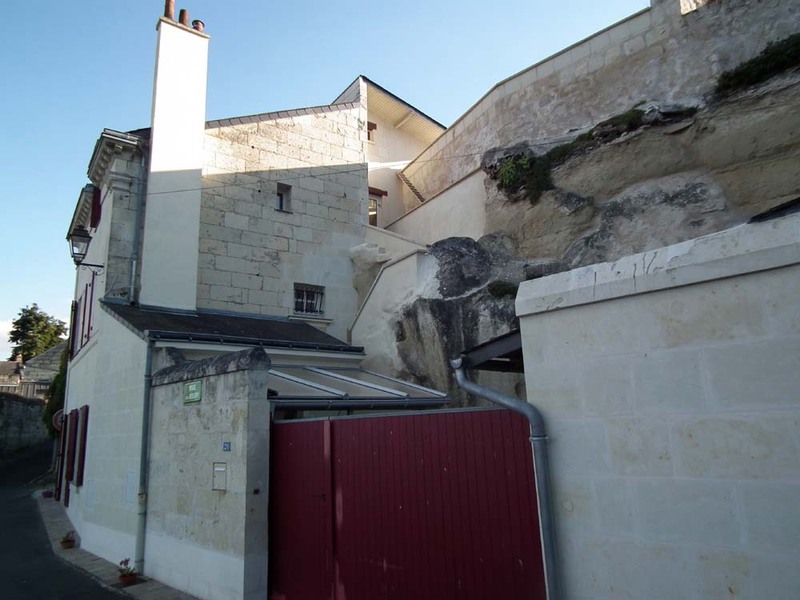 We love the look of this troglodytic house in Souzay-Champigny. Virtually all of the house is troglo, with the front facade meeting the natural rock on the left hand corner. I've no idea how many rooms there are. It could go a long way underground into the limestone cliff. We love the way the rock is not hacked away to neaten it up. It is more that the building moulds itself around the contours of the rock. At the back, up the top out of view, is a sun terrace. A la cuisine hier: Pumpkin roasted, puréed, divided into two batches and put in the freezer. Cooked apples suspended in the jelly bag in preparation for making apple jelly. Simon has just opened the last jar of last year's. I've opened a jar of Carrot Honey. I bought it off our friend Jean-Luc, who is a cheese producer not an apiarist, but he sells other local producers' stuff in his boutique. I laughed when he pointed out the carrot honey to me. I'd never seen honey labelled as coming from carrot before, but he assured me the field the bees had been visiting was nearby. I think there is a farmer who grows vegetable seeds in the area so I am guessing that's where the honey came from. I don't think it's from wild carrot, but I could be wrong. The honey is quite dark, liquid, with a distinctive taste, quite strong and warm, with citrus notes. Lunch was a huge plate of various salads -- celeri rémoulade, carottes rapée, roast beetroot in vinaigrette; 3 bean mix, sweet corn, butter lettuce, potato salad, tomatoes, kimchi, a boiled egg. All veggies organic from the market, all salads except beans and corn made from scratch including vinaigrette and creamy mayonnaise. Followed by a homegrown Red Delicious apple. Not my favourite variety of apple. They look magnificent with their shiny crimson skin, but even straight off the tree they lack flavour, the skin is tough and the flesh soft. Dinner was Simon's beef, beer and barley stew, from the freezer. Au jardin hier: I've finished the autumn mow so the whole orchard and vegetable garden has been cut at least roughly for the season (except for some strips I've deliberately left for wildlife shelter). Everybody is out madly completing outdoor maintenance tasks. We have at least another week of dry mild weather and no one can believe their luck. The first half of November is normally wet, so it all has to get done before then. Computer Woes: Our main office computer died about 10 days ago (mother board apparently). Simon ordered a replacement and it arrived yesterday. Unfortunately the package has been dropped somewhere en route and the computer damaged to the extent that it won't switch on. As yet no response from the suppliers regarding what they are prepared to do about it. Meanwhile we are sporadically trying to do Windows updates on my laptop. Unfortunately we don't have the spare three days it seems to require. This goose was wandering around the carpark of the new service station in Perusson/Loches the other day. 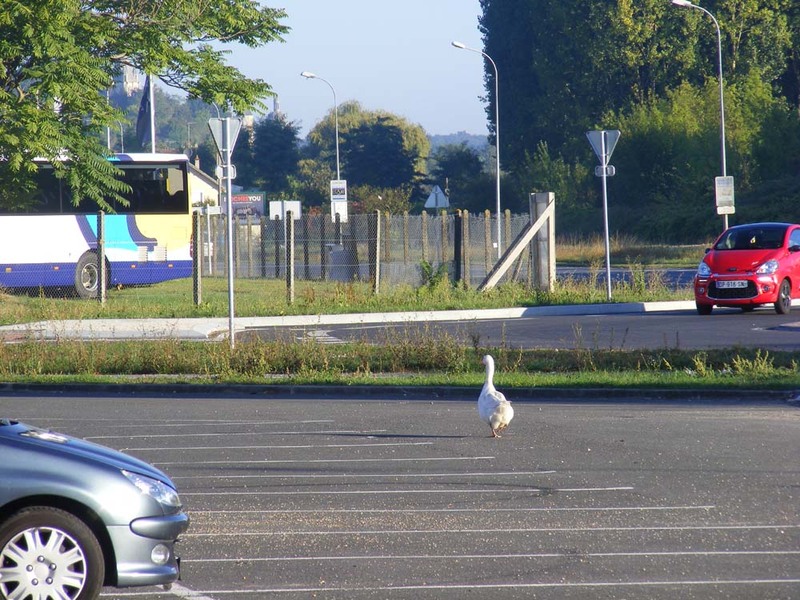 It appeared to be perfectly relaxed and unbothered by its solitude and odd situation. I suspect it was most at risk from being dinner for the gypsy encampment across the road rather than being run over. I've no idea where it came from and who might be missing it. A la cuisine hier: Oven baked crumbed chicken breasts served with chopped salad of purple skinned peppers, a bit of onion, tomato, sweet corn, beans and chilli. The crumb was flavoured with cumin and garlic. The peppers, tomatoes and onion came from the BioBoys and the Aged One. The sweet corn and beans were canned (thank you Elizabeth and Colin for the can of mixed beans). Vegetable and coconut curry from the freezer served with plain boiled rice (thank you Tim and Pauline for most of the vegetables). Loire Valley Nature: A new entry has been added for Wolf Spiders Pardosa spp, ground dwelling, fast moving sight hunters. A new entry has been added for Eurasian Kingfisher Alcedo atthis, a gorgeous little bird. In mid-September we had the opportunity to go out into the vines with Vouvray winemaker Alexandre Monmousseau. He took us up to his parcels at Montgouverne. Vines that have had their long tendrils trimmed. These two parcels are where he experiments with new techniques, so one of the things we talked about was his trials of plaiting the vine tendrils. Instead of clipping the long growing tendrils of the vines in summer as is the normal practice, he is experimenting with winding the tendrils around one another horizontally along the top support wire. Alexandre demonstrating plaiting (or trimming -- difficult to tell which...). The growing tendrils are trimmed because the plant diverts energy into them that the winemaker wants the plant to direct to the fruit, and the extra leaves cause a bit too much shade for the ripening grapes. However, Alexandre is intrigued by a new idea that the tendrils are the vines antennae, sensing environmental conditions that it should respond to. The theory is that if the tendrils are left to grow they will in fact stop of their own accord. However, they are a nuisance to the vineyard workers if they are left to wave about at head height, so they are gathered together in bundles and plaited around one another and the top wire. It's quite a lot of work but it is just swapping one task (summer trimming) for another, slightly later in the season (plaiting). In French the technique is referred to as tressée, which translates as 'plaited', but Alexandre couldn't remember 'plaited' so we suggested 'woven', which he got on with better. This will be the second vintage from these plaited vines and so far he is very happy with them. The brown grapes are sunburnt. The green grapes are in good condition. The summer was hot and dry, unusually so, and one of the other things Alexandre showed us was the sunburnt grapes. They have been frizzled by the endless sun, long before they are ripe, and are ruined. But with any luck the rest of the grapes are better than average. 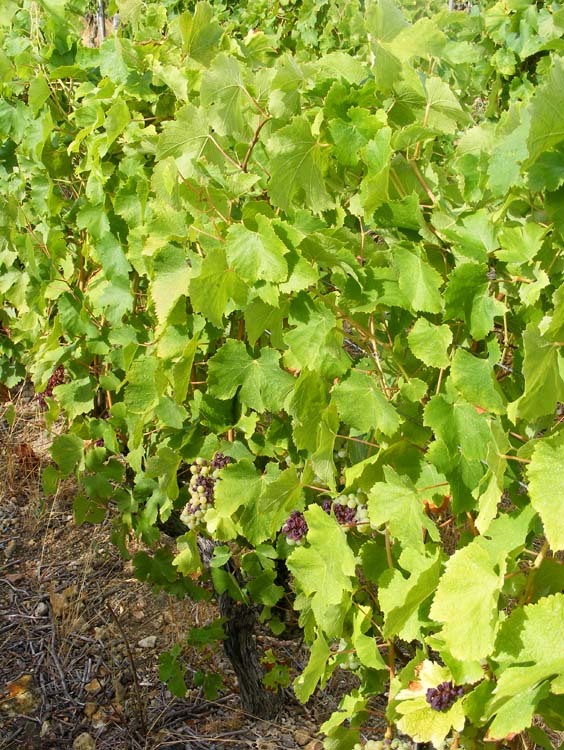 The rootstock these Chenin Blanc grapes are grafted to is called Vitis riparia 'Gloire de Montpellier'. 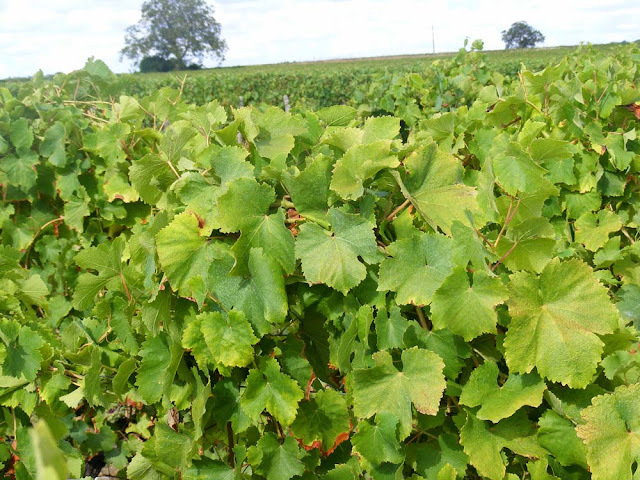 V. riparia is one of the grape vine species native to America that was brought in to introduce resistance to phylloxera. 'Gloire de Montpellier' is a variety developed for French conditions from that species. We also talked about other winemakers in the area. Alain le Capitaine, just down the hill from the Chapelle Saint-Georges in Rochecorbon, was very highly spoken of by Alexandre. Apparently he is a nice bloke and a very fine winemaker. Sometimes, admitted Alexandre, his wine is better than Chateau Gaudrelle's! Another winemaker we mentioned didn't come out of the discussion so well. I won't name and shame, but when we said to Alexandre we thought this person's wine was really terrible he agreed. He said the guy just doesn't have the passion, but inherited the winery from his father and grew up with the expectation that he would be a winemaker. His father, who Alexandre says made superb wines, is still alive, but retired. It's a shame all round, a tale of a misdirected life and the power of family expectations. It's always a treat to get out amongst the vines with Alexandre and I always learn a lot. French Expression: Two sentences which are jolly useful in discussions -- 'Je vois ce que tu veux dire' ('I see what you mean') and 'On ne voit pas l'intérêt' ('We don't see the point'). The first is literally 'I see this that you want to say'. To indicate you mean such and such or to ask what someone meant you use the form 'to want to say' in French. Where I might use the abbrieviated Latin 'ie' in written English, in French I would use 'c'est à dire' ('that is to say'), which can be used in writing or speech. The second sentence is literally 'One doesn't see the interest'. I would use 'on' in this case to distance myself slightly from the statement, so as to sound more polite or less blunt. 'On' translates literally as the English pronoun 'one', but in French is used much more frequently and much less formally, especially in spoken French. 'L'intérêt' is 'interest' in the sense of 'value', 'benefit', 'gain' or 'point'. To say that something is 'd'intérêt' is often to indicate that it is advantageous, especially financially, in French. The above is my understanding of these expressions, but as anyone who knows me is aware, my French is dodgy. Feel free to correct or clarify in the comments below. 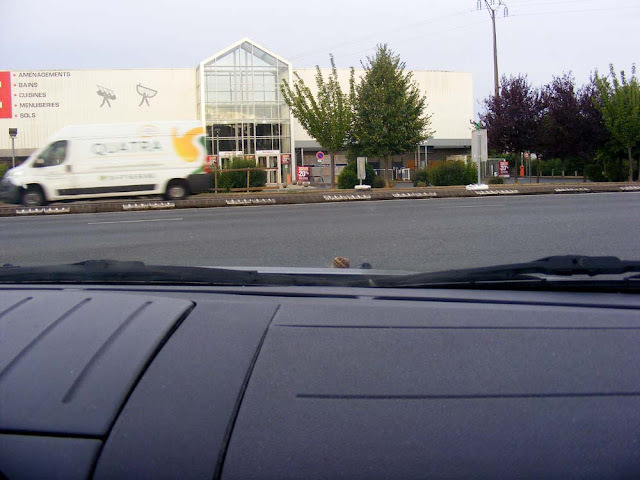 Loire Valley Nature: A new entry has been added for Greater Mouse-eared Bat Myotis myotis. At 13cm this is the biggest bruiser in the Loire Valley bat bunch. A la cuisine hier: Penne pasta with homemade tomato sauce and sprinkled with proper parmesan cheese. Followed by a homegrown Golden Delicious. One of our Golden Delicious apples produces the most beautiful looking fruit with pale creamy yellow skin and a pink blush. A good crisp, juicy, sweet apple. Flash fried steak (cut the French way, with the grain, and from the flank) with potato wedges, steamed cauliflower and blue cheese sauce. The potatoes from the Aged One, the cauliflower from the BioBoys. The sauce was a little box of Bridélice bechamel with the left over roquefort from yesterday. Dessert was canned pineapple chunks with the last of the whipped coconut cream. The brined onions are now doused in a hot pickling liquor made from cider vinegar and sugar and flavoured with cinnamon, allspice, caraway and cardamom. The onions have gone rather soft which is a shame. I think it would be better done with banana shallots because they are bigger and wouldn't soften so quickly. I wouldn't want them any sourer, but Simon thinks they are a bit sweet. He isn't keen on the spice combo either. 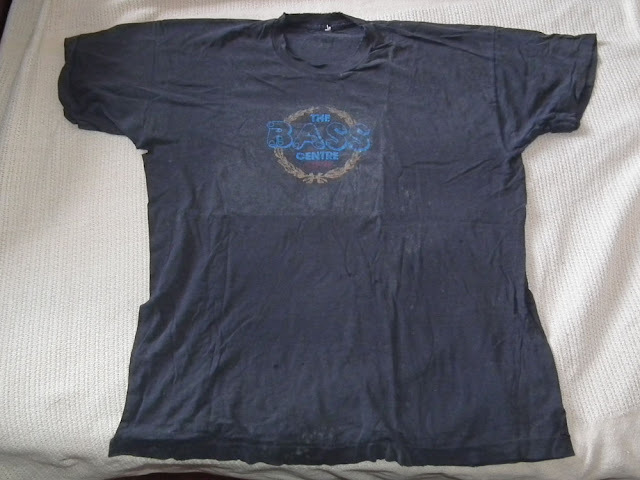 This T-shirt dates from 1998, and was bought at the Kennedy Center for Performing Arts on Memorial Day. 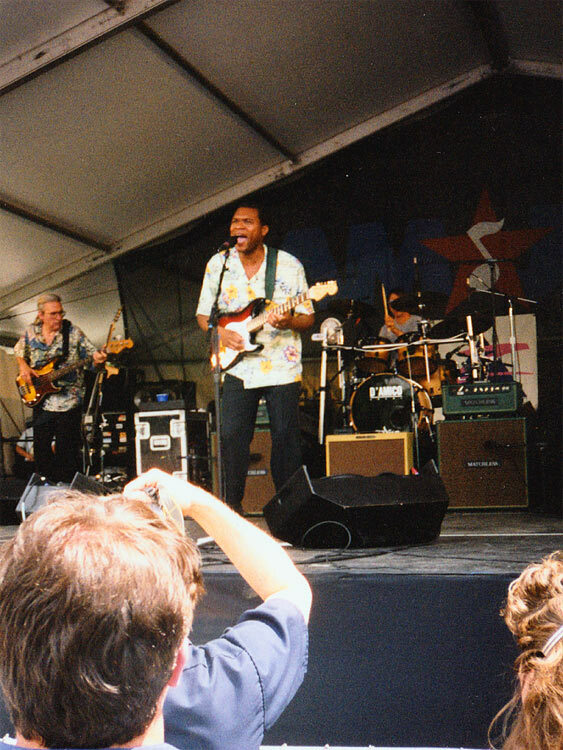 AmJam was a celebration of American music lasting the whole week-end, but I was only there for the Sunday day. I still managed to see Los Lobos, Arlo Guthrie, Sweet Honey in the Rock (I had to miss the Staples Singers to do so :( ), and Eddie Palmieri. The full line up for the three days is here. I was excited (almost beyond belief) that we parked in the Watergate Building, a place mythical in my childhood. 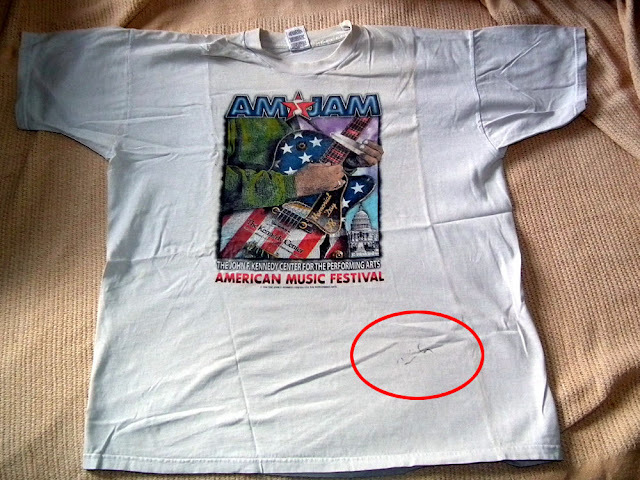 The dirty mark circled in red is Robert Cray's signature. Somewhere, I also have one of his guitar pics (plectrum...) but at the moment it is still in with stuff. I took the photo below on the same day. Loire Valley Nature: A new entry for Daubenton's Bat Myotis daubentonii has been added. Look out for their little pink noses if you want to identify them. A photo has been added to the entry for Bat Surveying in Indre et Loire, in case you were wondering what the bats had for dinner. Au jardin hier: The fog didn't lift until after lunch so I waited until 4pm to go down to the orchard. We've obviously had another frost in the last few days as the paulownia and the Chasselas grape vines have been frosted. I picked the last of the Black Hamburg grapes and I think I've got most of the walnuts. They clearly have nuts inside as two of them have been opened on the tree by some creature. I've never had the walnuts eaten on the tree before as far as I know. I picked up about half a bucket of perfectly useable windfall apples, planted half a row of leeks and sowed some crimson clover. The first of next year's orchid leaf rosettes has appeared. A la cuisine hier: Supermarket potato and leek soup with some roquefort cheese crumbled on top in a quite successful attempt to customise and improve it, followed by a homegrown reine de reinette apple. A grilled pork chop served with mashed potato and steamed carrots. Dessert was a slice of broyé aux framboises (a sort of shortbread and raspberry jam sandwich) with whipped coconut cream. I bought the broyé at the boulangerie and told Sophie behind the counter that I would be serving it with the coconut cream. She agreed that une note de coco would be perfect. She also had a bag of ten of yesterday's croissants for sale for €4.50 -- a total bargain. I said I would make croissants aux amandes with them. She suggested jambon fromage would be good too and made sure I knew they could be frozen. I laboriously peeled a kilo of little onions and put them in brine, the first step of pickling them. The onions are half my own homegrown, half from the Aged One. 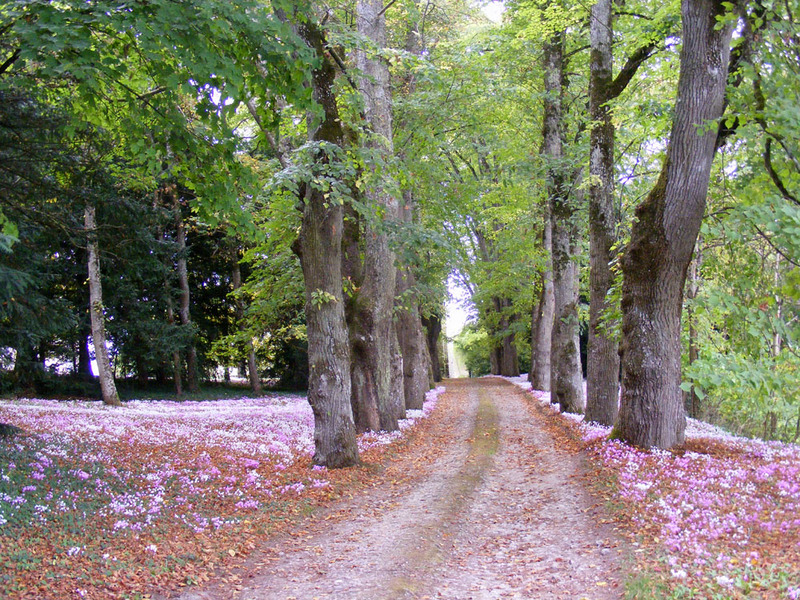 When my friend Suzanne was here in mid-September we took her to visit Chateau Gaudrelle. Alexandre Monmousseau, the winemaker and owner, made himself available for us and took us up to the vines to begin the visit. On the way up the hill we passed the Chapelle de Saint Georges and Simon remarked that we had never been inside. Alexandre immediately did a U-turn and popped in to Alain le Capitaine's winery, where the key for the chapel is kept. Key in hand, back we went to gain entry to the chapel. on the main body of the chapel are reused Merovingian carved blocks. The Chapel of Saint George is an 11th century building, enlarged in the 12th century by reworking the choir and adding a square pyramid topped 15 metre bell tower. The chapel is immediately adjacent to the cliff and hides an oratory cut from the rock itself, perhaps as early as the 5th century, but certainly by the 7th century. Inside there is a 12th century fresco, 13th and 14th century wall paintings and a small 13th century stained glass window. Fresco is a technique where pigments mixed with water are painted on to fresh wet render. Tempera is a wall painting technique where the pigment is diluted with water and a binder (usually egg) and painted on a dry wall. The first technique is much more resilient than the second because the paint and the render chemically bind more effectively as they dry. The oldest painting in the chapel seems to be at least partly done in the fresco technique. The more recent paintings are the second technique. Fresco is very rare in the Touraine and it's a much more technically demanding art form. 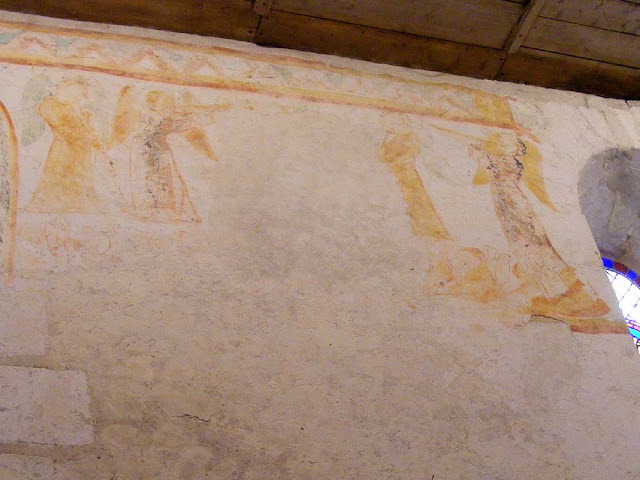 The painting on the left (below) is the earlier 12th century work, showing Christ washing the Apostle's feet. Stylistically it is typical of its time, with muscles and folds plainly marked in ochre and a very restricted palette of colours. Below this scene you can see the remains of an angel, and above there is a frieze of fantastical animals and Greek keys, also typical of the period. 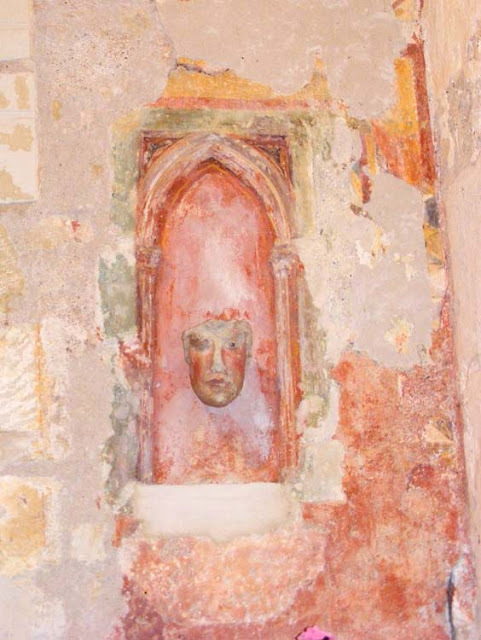 This is all that is left of the original decorative scheme of the chapel. 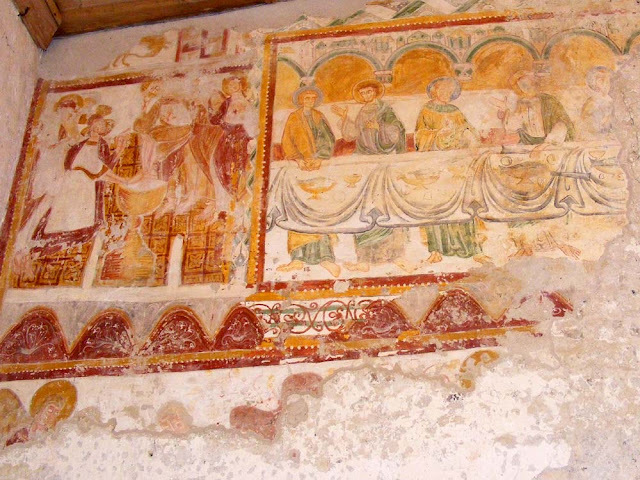 Fresco and tempera wall paintings side by side. The painting on the right is the remaining half of a Last Supper. The meal has been served in the medieval fashion, where all the dishes are shared and each plate is shared by two diners. This painting dates from the early 13th century and slightly overlaps the earlier work. The palette is richer, with green and lapis lazuli blue in addition to the ochres and white. The attitudes of the subjects are more natural and realistic too. The image is tightly co-ordinated by the device of the regular arches above the Apostles and the drapery of the table cloth below them. Above the arches is a band of architectural ornamentation representing Jerusalem. On the opposite (south) wall is the remains of a Last Judgement. All that can be still be seen are the angels with their trumpets and some decorative elements. This dates from the 14th century. The original entry to the chapel was in the western end, but in the 18th century the construction of a house which butts up to the church destroyed the porch and the door into the chapel was moved its current position in the southern wall. Evidence of an earlier building on the site comes from carved stones from the Merovingian period (8th century) embedded in the exterior walls. An angel and a king from an obscure Bible story. 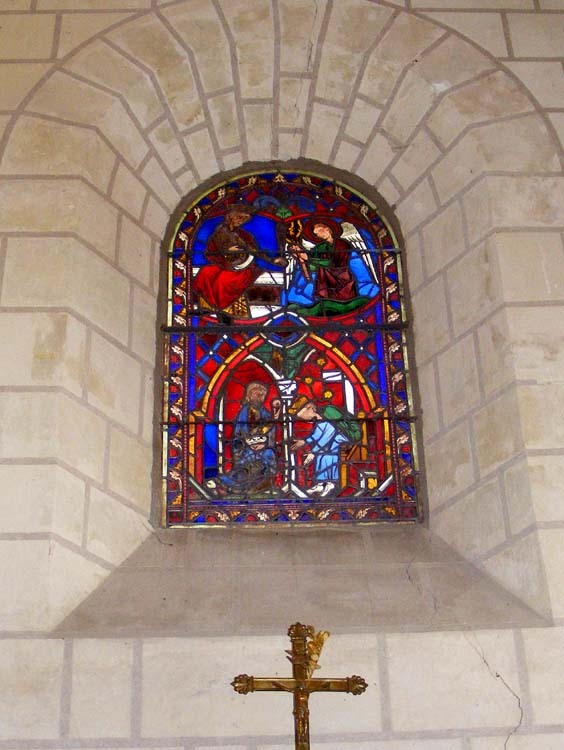 The stained glass window depicts the story of High Priest and King of Salem, Melchizedek, a contemporary of Abraham. I've no idea what this is or how old or original to the chapel it is. For more information read our friends Niall and Antoinette's blog posts about their visit to the chapel a few years ago. They wrote about the wall paintings, the stained glass and the Merovingian carved stones. 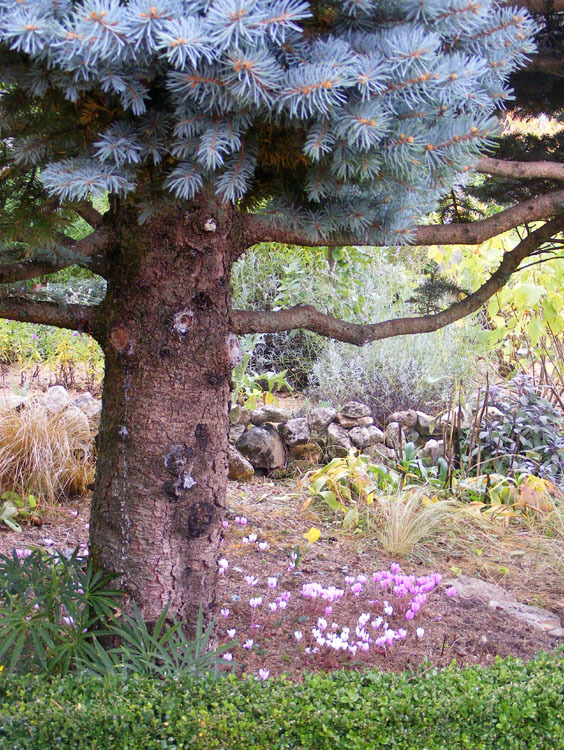 Learn Botany and Mycology: For readers living in the Touraine du sud who are interested in botany and/or mycology (and would like to practice their French), you could do worse than join the Association de botanique et de mycologie de Sainte Maure de Touraine. I've belonged for some years and it is a very friendly and welcoming club with a lot of expertise. Twenty or so outings per year are organised, usually on weekend afternoons, but sometimes whole days and sometimes mid-week. More details are available here. If you are really keen you could even do a botany MOOC and be mentored by expert members of the Association. Loire Valley Nature: A new entry has been added for Lesser Horseshoe Bat Rhinolophus hipposideros, a small species that uses the many caves (abandoned underground limestone quarries) in the Touraine to hibernate. 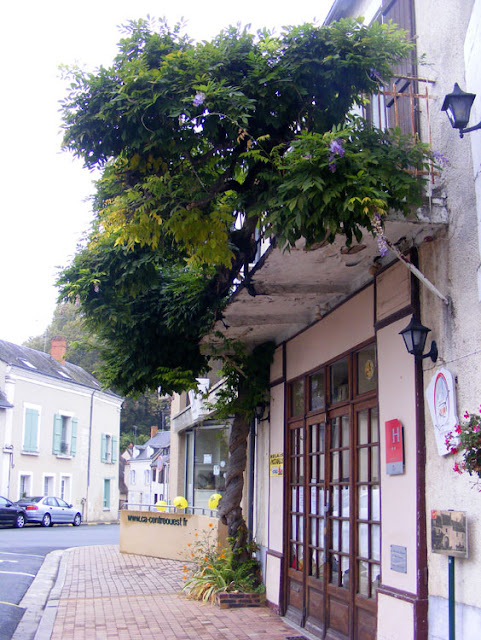 Photos have been added to the entry on Bat Surveying in Indre et Loire. Chateau tower roofspaces and caves are great habitat for bats. Prize plaques for Charolais cattle. On a walk in the Claise valley between Chaumussay and Preuilly I encountered this shed at the gateway of a farm. The metal plaques are prizes won for Charolais cattle at agricultural shows at the département and inter-département level for the decade up to 2004. Yellow is a first prize, blue is a second prize and green is a third prize. Red appears to be a tied or shared prize. The big creamy white Charolais breed is the most widely raised beef breed in France, but it is not as common as the Limousin breed in the Touraine. Curiously, although the breeds are Charolais and Limousin in English, because the word race (breed) is feminine in French, the breeds are called Charolaise and Limousine in France. Due to that gender agreement requirement in French you would say la viande charolaise (Charolais meat), but le boeuf charolais (Charolais beef). 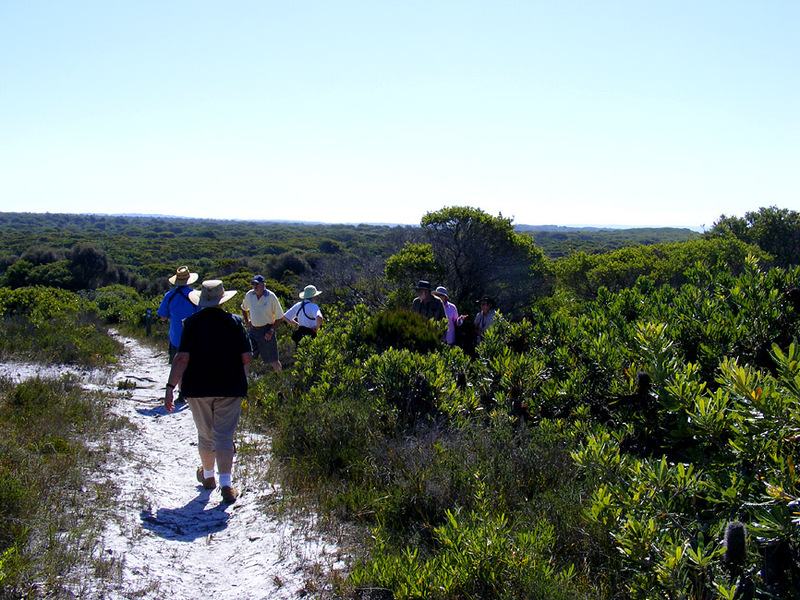 Trying to spot an emu-wren. This is my sister and her husband trying to spot emu-wrens in the grass. They are teensy weensy and brown, and none were seen on this occasion. Amongst birdwatchers they are notorious for being secretive and difficult to see. They are called emu-wrens because they have long fluffy tail feathers a bit like emu feathers. Emu-wrens are unique to Australia and are not related to 'true' wrens at all. They were given their scientific name Stipiturus and official description by the French physician and naturalist Réné Lesson after he visited Port Jackson on the Coquille expedition 1822-1825. Experienced Australian naturalist Ian Fraser has just managed to photograph his first emu-wren and has posted the photo on his blog, Talking Naturally. He's also got photos of bustard footprints, for those of you who remember my post on the Champeigne Tourangelle, which talked about the conservation efforts for our local species of bustard here in France. Our posts on Sundays have an Australian theme. If you would like to read more of them click here. Loire Valley Nature: A new entry has been added for Badger Meles meles. No photos of actual badgers unfortunately, but lots of digging and footprints. 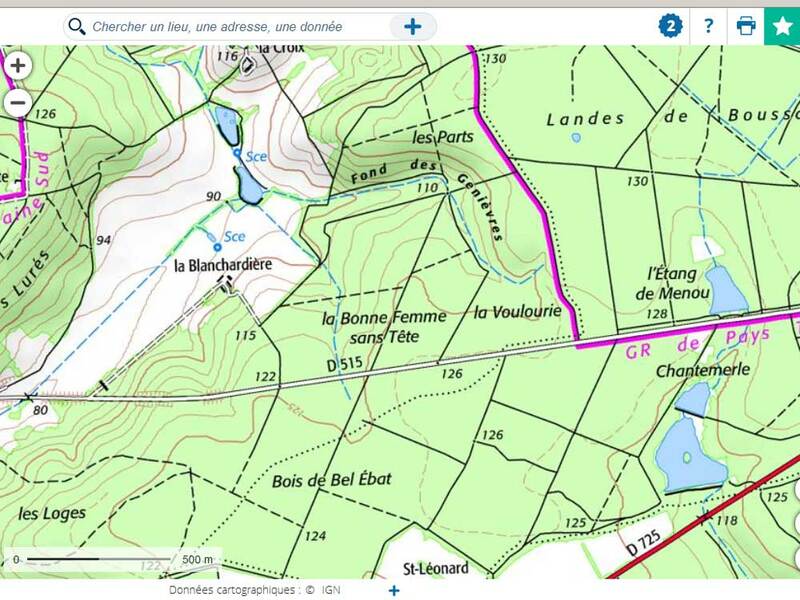 A new entry has been added for Bat Surveying in Indre et Loire. A new entry has been added for Barn Owl Tyto alba. 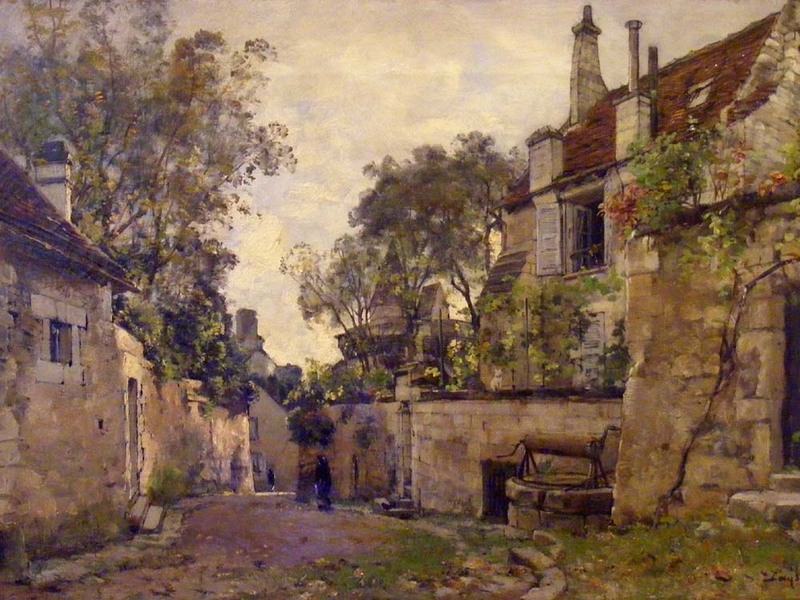 In the street outside his home, as painted by Lansyer. While I was at the 19th century artist Lansyer's house museum in Loches the other day I took the opportunity to photograph two views he painted of the streets where he lived. 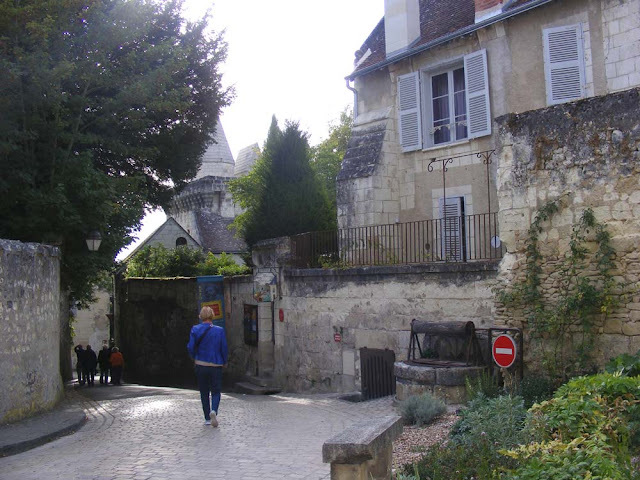 The first shows his own house on the right, looking down the street towards the Porte Royale. 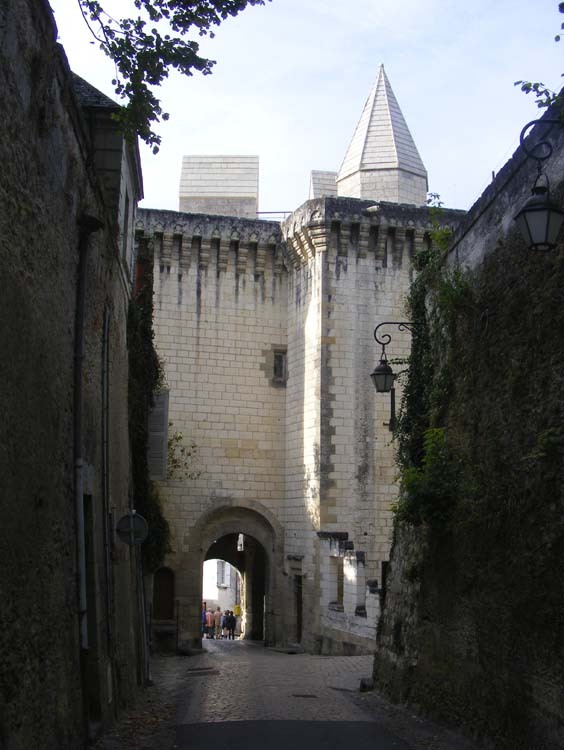 The second is looking down the street at right angles, looking directly at the Porte Royale. The scene today with Lansyer's house on the right. 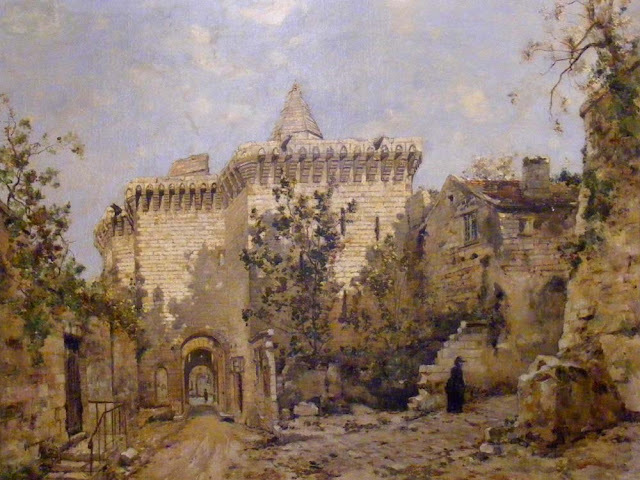 Looking towards the Porte Royale from on the citadel as painted by Lansyer. The newly restored Porte Royale as it is today. The pre-restoration view, as seen on StreetView in April 2016. I can't believe we don't have our own photo of this! 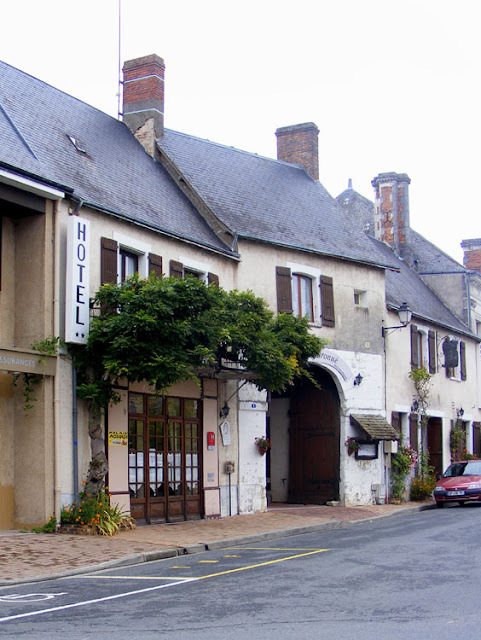 Nazelles-Négron is a small town on the Loire directly opposite the much bigger and better known town of Amboise. There is some debate about whether the name Nazelles comes from the Latin for nave (of a chapel) or the Latin for boat. Either way, it is a charming place strung out along the river cliffs and running seamlessly into the neighbouring community of Pocé-sur-Cisse. We visited recently because we took Célestine to the specialist classic car auto-electricians there (who turned out to be nice young men who clucked over Célestine and neatly improved but haven't quite cured her problem yet - it seems to be at least partly aged cables, but her headlights are still flickering). 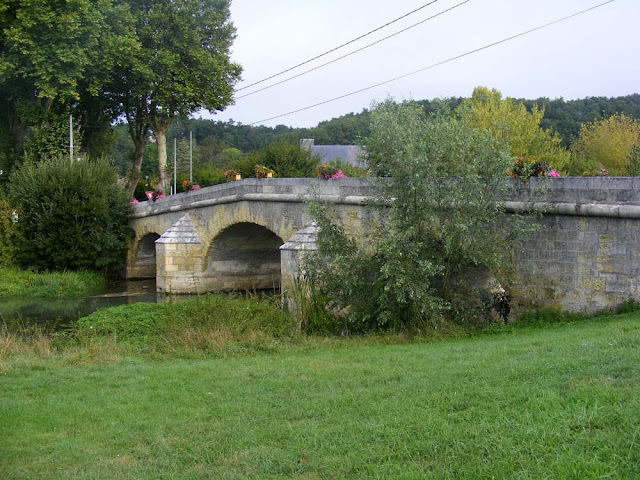 The bridge over the little River Cisse. The Cisse runs parallel to the Loire, through the middle of Nazelles-Négron, and finally joins the Loire on its right (north) bank at Vouvray. When there is flooding in the area it is often the Cisse valley which is most affected. Twice in the mid-19th century the Cisse took the brunt of breaches in the Loire levee bank, being inundated with a large volume of fast flowing water. If you look on the side of the Cave des Producteurs in Vouvray you will see the flood marker for 1856 and be astonished that the water was ever that high -- neither river is visible from the Cave des Producteurs under normal circumstances. 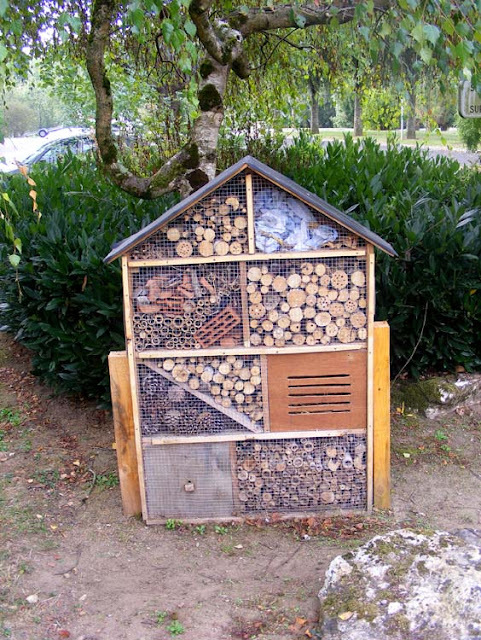 A good looking insect hotel. Nazelles-Négron is twinned with Vomp in Austria and the insect hotel was made by school kids from the two towns when the Austrians were on a visit. There was a nice explanation of what types of creatures could use each of the section stuck to the side of the box. For example, solitary bees (pollinators) such as orchard and mason bees like hollow stems to lay their eggs; the larvae and adults of flower bugs (predators of mites and aphids) will shelter in bits of bark and dried leaves; bumble bees (pollinators) might take up residence in the box with a 10 mm hole and a little landing platform; ground beetles (predators of slugs and wireworms) will like pieces of branches and tree stump; lacewing larvae and adults (predators of aphids and mites) will occupy the sections slot openings filled with wood shavings or pine cones; ladybird adults and larvae (predators of aphids) like the slot opening sections filled with dried leaves or pine cones; solitary wasps (predators of various larvae) like the holes drilled into wooden blocks and hollow stems; butterflies (pollinators) will use boxes filled with straw or dried grass; earwigs (predators of aphids and small caterpillars) like upturned terracotta pots stuffed with straw; hover fly larvae (predators of aphids) like hollow stems. Looking down the Cisse Valley. The building in the left distance is the privately owned Chateau of Nazelles, situated in the delightfully named rue Tue-la-Soif (Kill Thirst Street). It was built in 1518 and remodelled in 1765. Along this section of the river cliffs there are half a dozen chateaux. 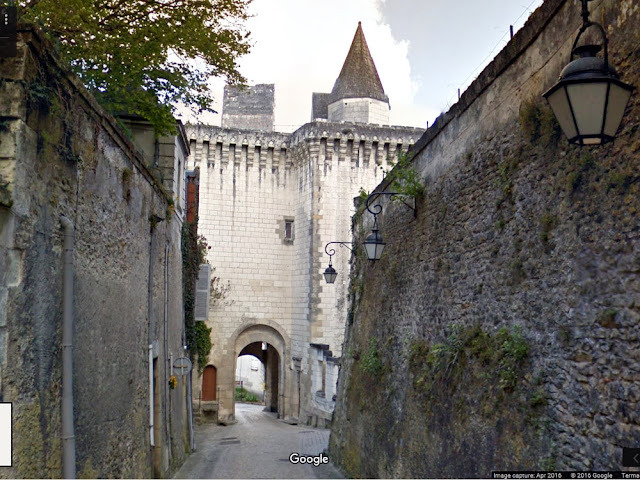 One of them is the 18th century Chateau de Perreux, which is just a grand single pile fronting on to a vast underground gallery system according to a friend of ours who lives in Pocé (just a few doors down from Mick Jagger, as it happens). 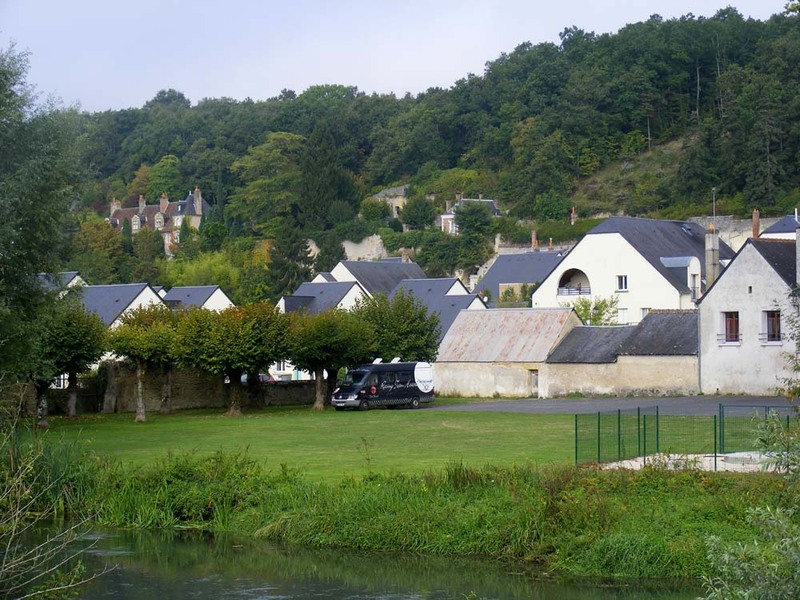 Situated 20 km east of Tours the Champeigne is composed of two cereal growing plateaux divided by the valley of the Indre river. 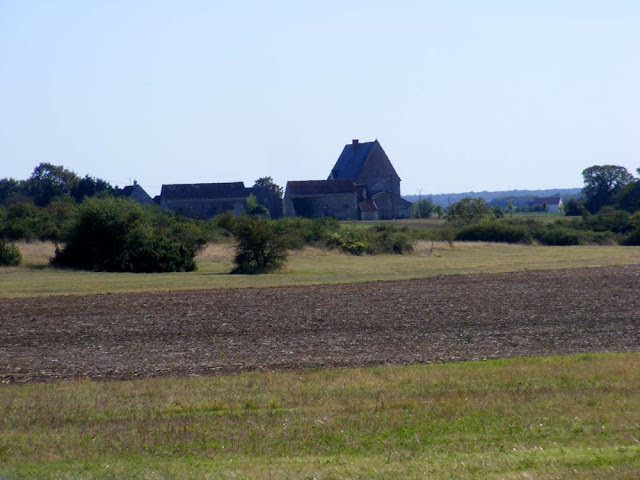 Roughly speaking it is the countryside between Bléré and Loches. Frankly, it looks nothing special (although it is dotted with very pretty villages) but as Simon has already mentioned, today's landscape hides a record of an extraordinary level of prehistoric activity. 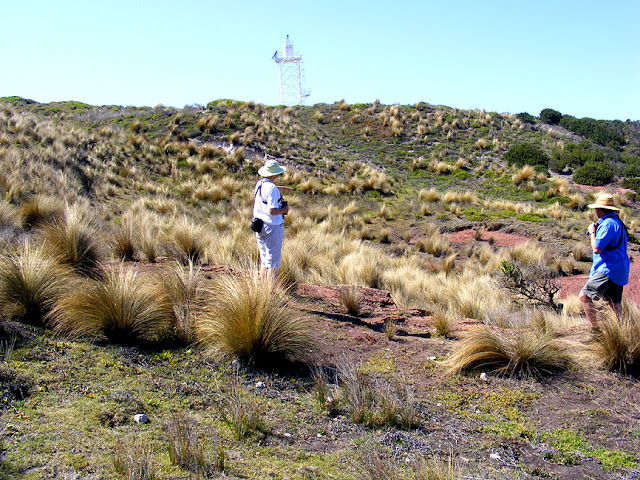 In addition, it is home to some of our rarest and most vulnerable lowland plains bird species. 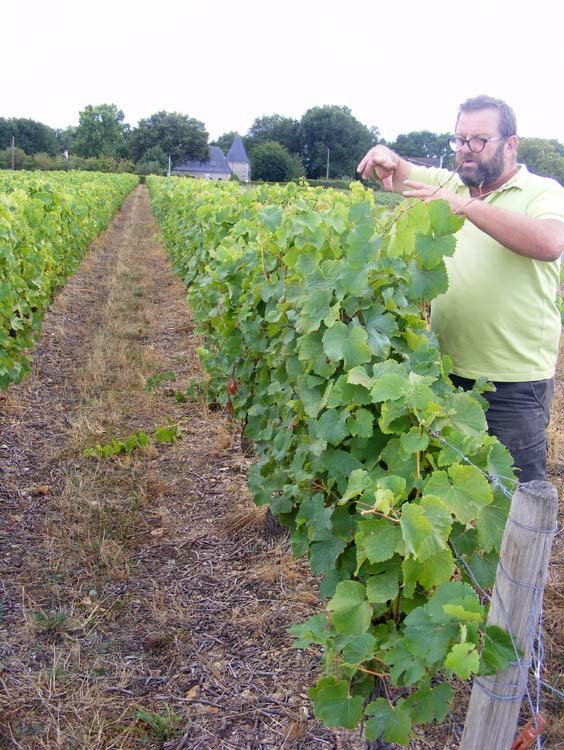 As a result, ten years ago the Champeigne Tourangelle was designated as a special nature protection zone and integrated into the Natura 2000 network, becoming one of six such areas in Indre et Loire. Autumn Squill Scilla autumnalis (Fr. Scille d'automne) photographed near Sublaines. 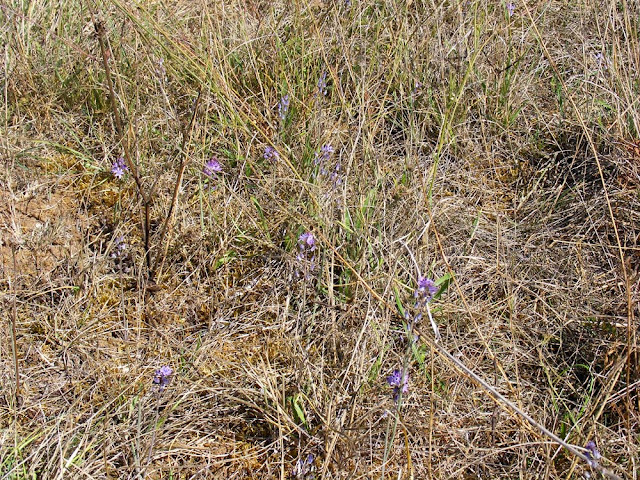 A rare and protected plant of dry grasslands on alkaline soil such as you get in the Champeigne Tourangelle. The species the zoning is designed to protect are: Little Bustard Tetrax tetrax (Fr. Outarde canepetière), Eurasian Stone-curlew Burhinus oedicnemus (Fr. Oedicnème criard), European Golden Plover Pluvialis apricaria (Fr. Pluvier doré), Hen Harrier Circus cyaneus (Fr. Busard Saint-Martin), Montagu's Harrier C. pygargus (Fr. Busard cendré), Short-eared Owl Asio flammeus (Fr. Hibou des marais), Merlin Falco columbarius (Fr. Faucon émerillon), Short-toed Snake Eagle Circaetus gallicus (Fr. Circaète Jean-le-Blanc) and Red-backed Shrike Lanius collurio (Fr. Pie-grièche écorcheur). The zone stretches across seventeen local authorities: Athée-sur-Cher, Azay-sur-Indre, Bléré, Chambourg-sur-Indre, Chanceaux-près-Loches, Chédigny, Cigogné, Cormery, Courcay, Dolus-le-sec, Genillé, Le Liège, Luzillé, Reignac-sur-Indre, Saint-Quentin-sur-Indrois, Sublaines and Tauxigny. 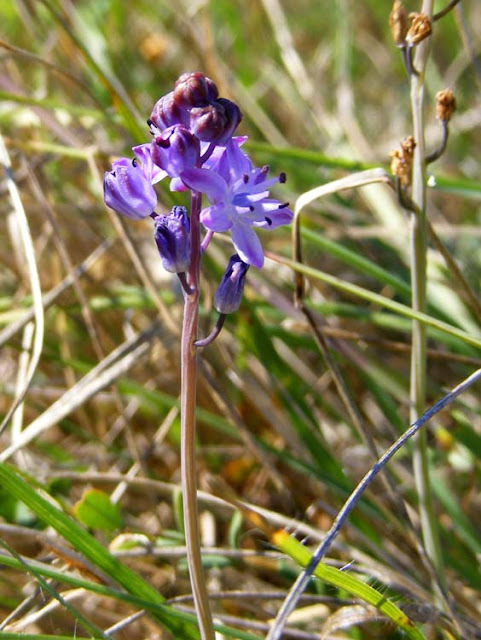 Autumn Squill in the grass on an uncultivated area in the Champeigne Tourangelle. 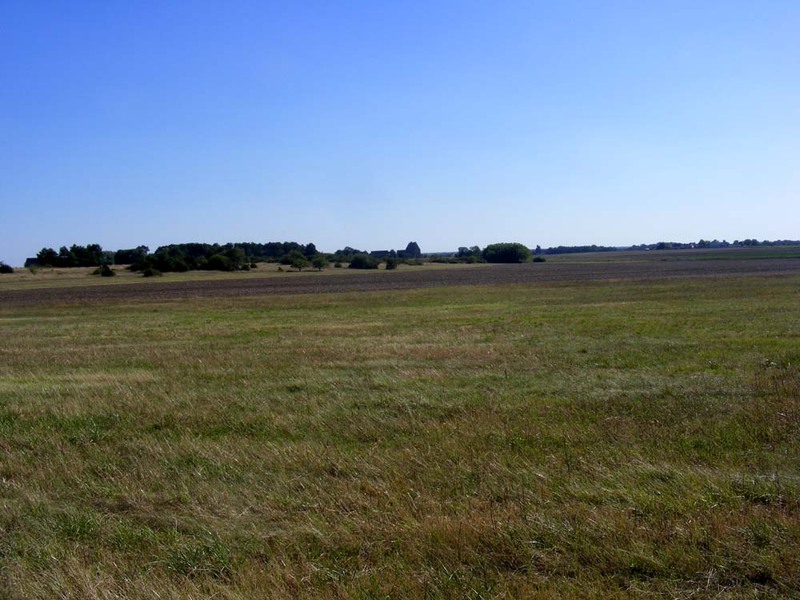 Although the designation is as a site for bird protection, it was very nearly designated as 'habitat' because of its chalk grasslands, but in the end the presence of 50% of the region's population of Little Bustard swung it for 'birds'. It was felt that protecting the bustard protected the rest of the species and their habitat. The bustards are counted annually to monitor their progress and earlier this year we saw three birdwatchers on the side of the road between Chédigny and Sublaines, just where I had seen a couple of bustards fly over a few year's earlier. They looked like professionals and I reckon they were doing the annual count. The objective of the protection zone is to maintain, restore and develop the habitat of the open plain, corridor hedges and wooded copses in order to ensure the birds have a food supply, and mortalities and disturbances of the birds are minimised. 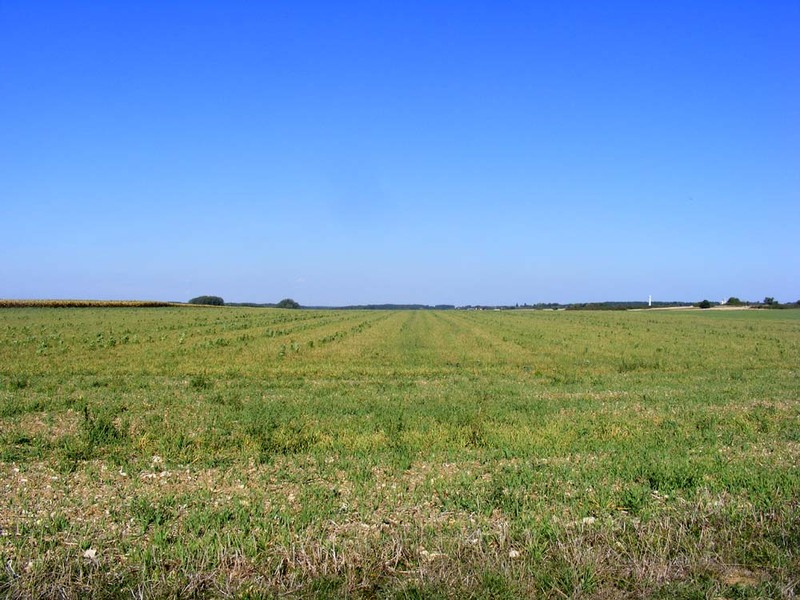 Ninety-five percent of the land in the zone is either cultivated or fallow agricultural land. This means that the local farmers are simultaneously the greatest threat to the target species, and their greatest protectors, depending on how they choose to farm the land. Tourist and leisure activity in the zone is discouraged on the grounds that it inevitably disturbs the birds (hot air ballooning, quad bikes and tourist excursions are viewed particularly negatively in this regard). Also considered a problem are the electricity wires and the main roads and vehicular traffic traversing the zone. (taken from what we think is the prehistoric trackway). The success of the zone is seen to lie very much with the locals, and many farmers now participate in a programme to grow 'bustard pasture'. Mostly this works extremely well, with the farmers agreeing to grow lucerne which is mown for hay after the ground nesting birds have fledged their young and are more mobile.The management of the area is down to a committee of all the stakeholders and hopefully avoids issues such as inappropriate dates set for the haymaking and some means of negotiation when the season does not favour the farmer (eg if the summer is very dry and the lucerne loses nutritional value if left too long before cutting). For several years before the zone was created the local farmers and hunters rejected the project. It was only after the Communauté de Communes Loches Développement appointed a mediator that progress was made towards agreeing how the zone could be managed for the benefit of all. 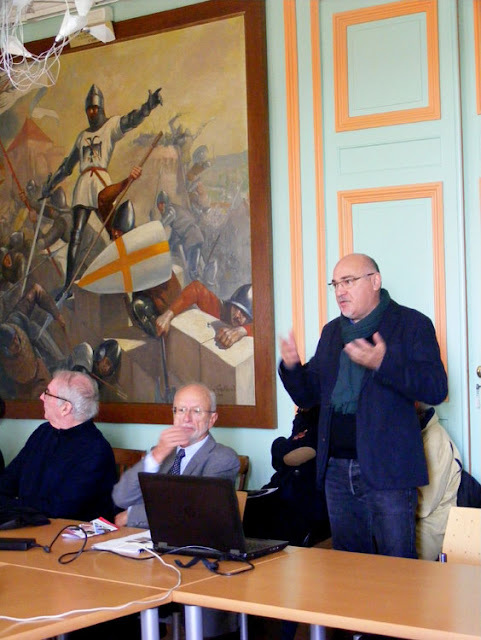 The objectives for the project were laid down by representatives from the Indre et Loire Chamber of Agriculture, the Hunt Federation for Indre et Loire, the League for the Protection of Birds (LPO) and the Society for the Study, Protection and Management of Nature in Touraine (SEPANT). The management committee is made up of a State official, a representative from each of the four organisations who created the objectives and three farmers. It is seen as essential that everyone has a voice and the power to influence the management of the Champeigne. A typical farm, we believe medieval in origin. Given that modern arable farming is the single most problematic threat to biodiversity in the Touraine (in my opinion at any rate) this is a really delicate balancing act. Modern agriculture does not favour arable 'weeds' or ground nesting birds. The Champeigne is a fence free mosaic of hard and soft wheat, oats, barley, canola and peas in the winter/spring and sunflowers, maize, barley, sorghum and millet in the spring/summer. 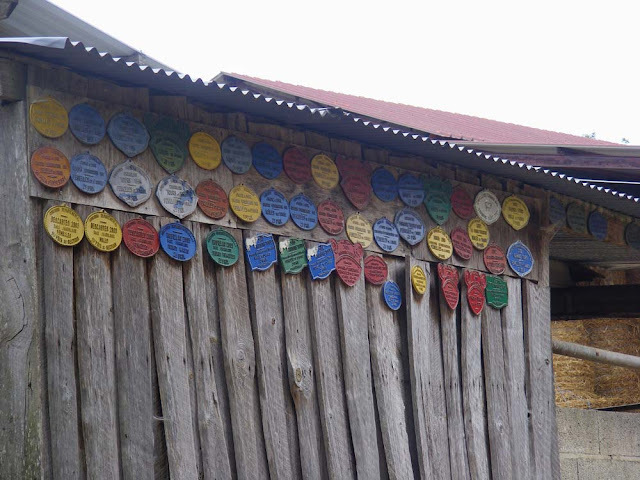 This variety of crops actively contributes to maintaining the biodiversity. 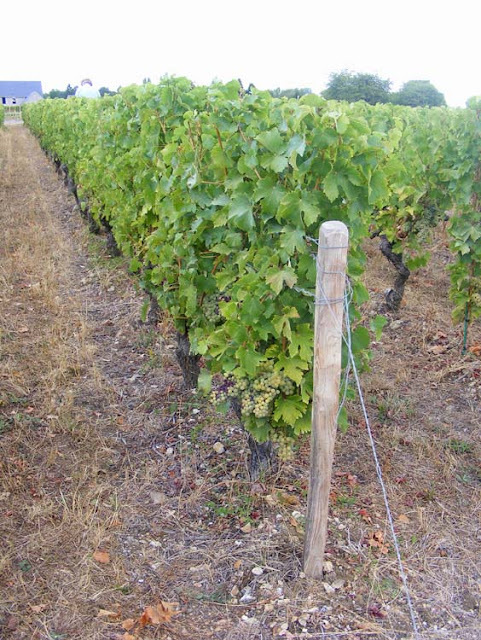 The Champeigne has been cultivated for so long it is part of the ecosystem now, and without it the land would completely change, taken over by invasive plants and other pest species. A century ago the mosaic would have included pasture and domestic animals, but that disappeared as arable farming and especially cereals became more profitable and began to dominate. That is why the lucerne and the fallow land is an important part of the mix in today's management. 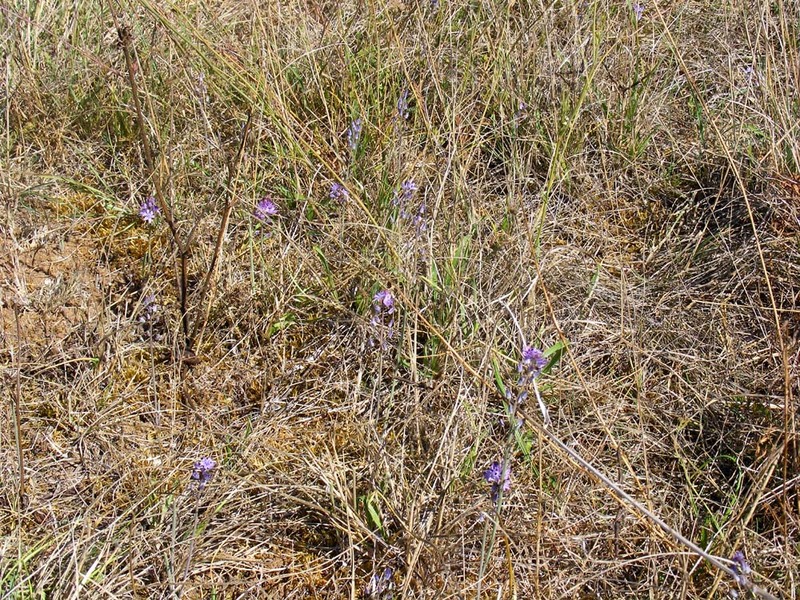 It acts as a proxy for traditional extensively (ie the opposite of intensively) managed pasture. Another typical view of the Champeigne Tourangelle. The set aside or fallow land, known as les jachères in French, was until recently obligatory France wide and farmers were compensated for leaving land uncultivated. This was to reduce overproduction of cereals and try to control the build up of nitrates in the environment. Nowadays, with a world shortage of cereals, set aside is voluntary but many farmers continue to use the technique as part of their package of land management tools. They are encouraged to do so in areas such as the Champeigne where there is a concern about maintaining the traditional elements of the countryside, and a continuing concern about agricultural runoff (including nitrates) into the fresh water network. Au jardin hier: The growing season for this year has come to an abrupt halt, with a frost. My row of bean plants, which I sowed very late, still had lots of beans on them, but the frost has got them. I picked two thirds of the apples and have 10 big trays and 4 small ones of six different varieties in the pantry waiting to be made into jellies, compotes, crumbles and cakes. I've picked most of the grapes too, but that's more a result of the crop being small rather than me being worried about them. I'm gathering the walnuts as they fall, but they don't look as though they will be very good quality. I'll let them dry for a while before cracking them and finding out. A la cuisine hier: Grilled pork chops, mashed potato, steamed carrots, creamed zucchini and a delicious spicy chutney that Simon's cousin Linda gave us, followed by a fresh pear.